we offer superior ductless HVAC units. Ductless HVAC systems allow you to control the comfort of each room in your home without the fuss of installing a central heating and cooling system. With more energy-saving capabilities than standard portable units, ductless HVAC units can optimize your home's energy use. At Meacham Companies, we can provide easy-to-install, energy-efficient ductless heating and cooling units in Central MA, which can effectively lower energy bills and boost home comfort, performance and value. If your home does not have existing ductwork, then a ductless heating or cooling system can be much less expensive than installing a central HVAC unit. Mini-split heating and cooling units also require a less dramatic and invasive installation than standard HVAC systems and according to the United States Energy Department, 30 percent of energy could get lost in traditional duct systems, with a mini-split HVAC unit, this can be avoided. Their small size allows you to control your heating and cooling capabilities in individual rooms, with more optimization than standard portable HVAC units. This level of control also speaks to room design, allowing you to install the system in more places than a window unit with easier remote control access. Since most systems are installed with only a small access hole, ductless HVAC systems are a safer alternative as well. With ceiling-mounted, wall-mounted and floor-mounted ductless heating and cooling units from Mitsubishi Electric, your home can have enhanced comfort where needed, when needed, with systems that are designed to optimize energy usage, maximize comfort, and blend in with the room. 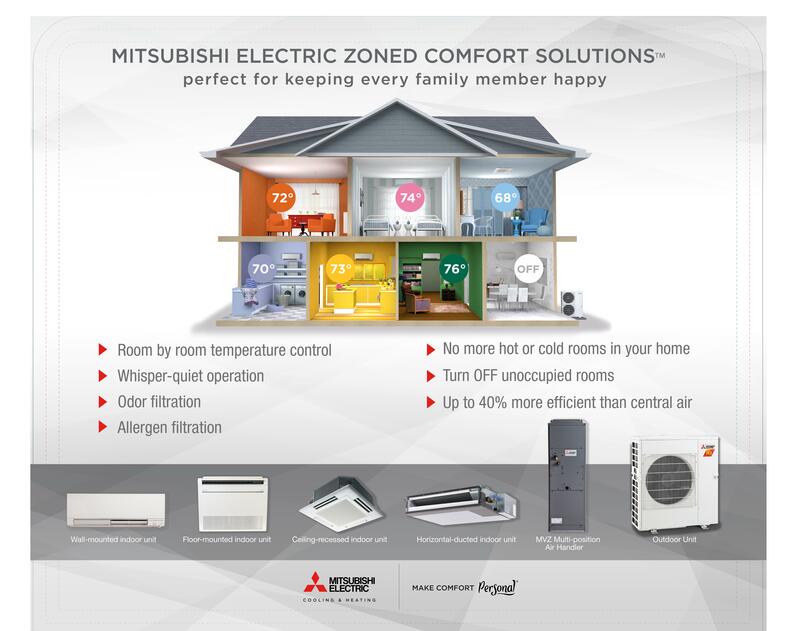 Mitsubishi Electric has been providing innovative products for over 30 years and they are among the world's top manufacturers for HVAC systems, providing personalized comfort to homeowners without compromising the environment, designing and producing units in eco-friendly facilities, with sustainable, innovative materials. Suspended ceiling-cassette indoor units are one-way and four-way systems that accent your ceiling with a sleek, elegant design and provide rooms with direct, conditioned air. Smart wall-mounted indoor units automatically adjust fan speed to provide precise comfort based on room conditions. With sleek, elegant designs, this unit will enhance your room's appearance. Floor mounted units are designed with hot-start technology and multi-flow vanes, which allow for a quick hot air response and maximum performance even in cold climates. Hyper-heating INVERTER® technology can provide -13° F outdoor ambient and 100% heating capacity at 5° F outdoor ambient. If you want to increase your home's energy efficiency and comfort, Meacham Companies can provide the right heating and cooling solution for you. Ductless air conditioning and heating may be a viable solution if your home has no existing ductwork and if you wish to optimize your home while improving its performance. Call us today at 1-855-212-6496 or contact us online to get started with a free estimate in Auburn, Hopkinton, Sudbury, Paxton, Uxbridge, Sutton, Weston Framingham, Franklin, Waban, Princeton and the nearby areas.